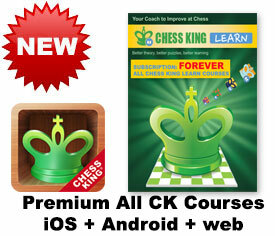 Chess King Learn web + iOS + Android All Chess King courses subscription - FOREVER. This subscription covers all the courses below, forever. At the moment there are 60, will be more added to this list in the future. This is a premium subscription, guaranteed without ads. After purchase you will get your purchase code, you will enter it on the Chess King Learn Site Subscribe page, after which the web access will be open to you (need to register if not yet done). Then if you wish download the iOS or Android app (links in the Chess King App page), those are free downloads. As soon as you link your mobile app to your Chess King account all your courses will open on iOS and Android. Progress will sync between all devices. You can install in as many devices you own as long as you are connected to the same Chess King account. This teaching program is a kind of guide. It will introduce you to the rules and laws of chess and let you work your way of improvement from the level of Beginner to the one of Club Player. In the course 100 chess topics are considered including rules of chess game; methods of playing in opening, middle game and ending; combinational techniques and basic elements of strategy. All in all, the course contains 500 teaching examples and 700 exercises useful for consolidation of acquired knowledge. This course is based on a bestseller by the experienced coach Sergey Ivashchenko which became a sort of chess publishing sensation and sold over 200,000 copies. More than 1200 training exercises are intended for beginners, both children and adults. Elementary and simple tasks (1-, 2- and 3-way) are used as teaching material. If you are a beginner, it is necessary for you to study simple tactical methods and learn how to employ them! This course includes more than 4300 exercises for beginners on the following tactical methods: Fork, pin, double check, discovered check, annihilation of the opponent's king defense, exploiting a back (1st) rank weakness. If you are a beginner or a club player, this is the program for you! After going through this course you will never miss an elementary combination in a practical game of your own and will be able to improve the quality of your play considerably. If you are a beginner, you just cannot afford to give away your piece in 1 move, presuming, of course, that you wish to improve your play! Another thing you cannot afford is to miss a chance of grabbing an undefended piece of your opponent's! This course includes more than 1400 exercises with a few pieces on the board. Such a great number of exercises makes this course an excellent tool for quick training of chess beginners. The course is intended for players who are already acquainted with the rules of the game. Even if you study and solve only 20% of exercises you are sure to improve your chess skills and not to miss a chance to take an undefended piece in your practical game! All the exercises are taken from practical games and arranged according to the names of pieces and difficulty levels. If you are a beginner, you just cannot afford to give away your piece in 1 move, presuming, of course, that you wish to improve your play! Another thing you cannot afford is to miss a chance of grabbing an undefended piece of your opponent's! This course includes more than 1500 exercises with lots of pieces on the board. Such a great number of exercises makes this course an excellent tool for quick training of chess beginners. The course is intended for players who are already acquainted with the rules of the game. Even if you study and solve only 20% of exercises you are sure to improve your chess skills and not to miss a chance to take an undefended piece in your practical game! All the exercises are taken from practical games and arranged according to the names of pieces and difficulty levels. If you are a beginner, you should practice much to mate in one move. This course provides excellent material for this training. The big number of exercises (2500) covers different methods of mating. Many of them is an excellent tool for speed training even for stronger players. This is a rare course that is intended even for players with USCF rating of 600. Even if you only study and solve 10% of the exercises, you will learn a huge number of mating patterns and probably never miss a mate in one again! This friendly interactive course is intended for both children and adult beginners. It is divided into 2 main sections: Chess rules and Playing. 500 carefully chosen, and in many cases designed, examples to help a student. If you are a beginner, you just have to learn how to defend your pieces from being taken! Every chessplayer has to master and consolidate some basic defensive skills such as withdrawing or protecting a piece, interception or attacking an opponent's piece. Having consolidated your knowledge by doing a great number of exercises you will be able to improve your level of playing. This course includes more than 2800 exercises with lots of pieces on the board. Such a great number of exercises makes this course an excellent tool for quick training of chess beginners. This is a course for club players based on a textbook by a distinguished Russian chess trainer Victor Golenishchev. The source material is supplemented with examples of play by lead chess players from the latest major contests and is organized in chess lessons. The course contains 57 themes, including theoretical material and practical exercises. The theoretical part includes more than 400 examples of play. The practical part includes more than 200 exercises of varying difficulty. A fundamental course on chess tactics for Beginners. The course contains 150 teaching examples and 1500 new exercises useful for consolidation of acquired knowledge. The exercises are classified according to more than 30 tactical methods and motifs. A fundamental course on chess tactics for Club Players. The course contains 240 teaching examples and 340 new exercises useful for consolidation of acquired knowledge. The exercises are classified according to about 30 tactical methods and motifs. CT-ART. Mating Combinations program is the unique due to two causes: the high quality of the theoretical material and a new technology of giving the studying material, the iBook technology that uses hyperlinks and additional windows for comfortable usage of the studying material. The course is prepared by the famous coach Victor Khenkin and includes 1200 instructive examples on 14 themes, each of them illustrates the peculiarities of using certain pieces for mating combinations and 700 exercises for you to solve. The fundamental chess program for club players. This second part includes more than 2600 exercises (more than 400 examples to explore and 2200 to solve), classified in 60 tactical methods and motifs. This course is an interactive tutorial for those unexperienced players, both children and adults, who have already learnt the rules of chess and now wish to become players of intermediate strength. This course covers a wide range of opening, middlegame and endgame subjects. It starts off by teaching you how to checkmate the lone king and proceeds to more advanced topics, such as utilizing a material or positional advantage. This program includes 55 lessons with more than 1200 instructive examples and exercises. This course turns a beginner into an intermediate player! The best way to improve your game is to train yourself on your device in solving problems from practical games. If you a beginner but already know how to mate in 1 move, you have to move on and learn how to attack a king and give mate in 2 moves! This course includes 19 000 exercises from masters games. In every exercise you will have to find a best continuation for an attack against the king. All the exercises are taken from practical games and arranged according to the names of pieces and difficulty levels. A great number of exercises makes the course an excellent tool for quick training both beginners and club players. This course includes more than 2500 exercises for mating in 3 or 4 moves. You will have to use your fantasy and precise calculation in order to find a correct way of attacking the king. After going through this course you are sure to improve your skills and abilities considerably and will not miss an opportunity to employ a nice little combination in a practical game of your own. The program is intended both for club players and intermediate players. All the exercises are taken from practical games and arranged according to the names of pieces and difficulty levels. If you are a beginner, it is necessary for you to study simple tactical methods and learn how to employ them! This course includes more than 1800 exercises for beginners on the following tactical methods: 'annihilation of defense', 'decoy', 'interception' and 'distraction'. The course is based on the 3 other courses: Beginners to Club, Chess Strategy for Beginners and Total Chess Endings. We carefully selected tasks that are not so easy to play, but not so complex to study. The material is adapted to beginners, and contains a large number of explanations and hints. Much attention is devoted to methods to win having an extra pawn. But we also recommend to pay attention to the technique of standard mates (starting with mates by heavy pieces and ending with mates by bishop and knight). This is a perfect opening manual. It features a theoretical review of all the chess openings, which are illustrated by instructive games of the greatest chess players. This compact opening manual contains a detailed classification, which makes it useful to players of any level - beginners, intermediate and advanced players. Each opening variation is supplied with evaluations and characteristics of key moves. The history of the variations' development is described, as well as their current status. The theoretic material is nicely illustrated by classic games with detailed annotations that demonstrate the principal ideas and plans of each variation for White and Black. There is also a special training section with more than 350 exercises of various difficulty on more than 40 openings. This is a course for intermediate players based on a textbook by a distinguished Russian chess trainer Victor Golenishchev. The source material is supplemented with examples of play by lead chess players from the latest major contests and is organized in chess lessons. The course contains 34 themes, including theoretical material and practical exercises. The theoretical part includes more than 290 examples of play. The practical part includes more than 750 exercises of varying difficulty. All 940 games played by the legendary World Champion, 217 of them with commentary. 180 exercises: play like Fischer and play against Fischer. The material used in the program is based on a textbook by a renowned chess trainer Sergey Ivashchenko - Manual of Chess Combinations vol 2. Total Chess Endings course composed by GM Alexander Panchenko. It's aim is to teach a student the intricacies of the endgame through a theoretical section, which includes over 600 games/lectures, each of them illustrating theoretical and practical endgame methods, and training section, with more than 2400 endgame exercises, classified according to 500 endgame themes. The material written by IM ICCF Alexander Alpert. The legendary tactics course that has been voted more than once by chess experts as the best chess training program in the world. This version includes 2,200 basic exercises and 1,800 auxiliary exercises, divided into 50 topics. The course is based on the bestselling book Combination Motifs by a renowned trainer grandmaster Maxim Blokh. All positions have been hand-picked over the course of 20 years of training practice and come in the order that ensures most efficient learning. Each position comes with a special hint unique to this course – a 5x5 mini-position designed to convey the very essence of the tactical maneuver used in the main example. Encyclopedia of Opening Blunders – learn to play chess by learning the opening mistakes and traps that have been discovered over time. The program is designed for studying the blunders in more than 40 openings and contains over 1,250 instructive exercises of varying difficulty from practical games. This chess program presents many instructive positions with 18 most important strategic themes such as Advantage in development, Advantage in space, Attack on the king, Attack on the queenside, Weak squares, Pawn structure, Open files and diagonals and others. Chess Middlegame I course composed by GM Alexander Kalinin is aimed at teaching a student much of the middlegame methods and intricacies through a theoretical section. Typical Plans and Methods in the Most Popular Openings: Scotch, Ruy Lopez, Sicilian, Caro-Kann, French, English opening, Dutch, Slav, Catalan, Nimzo-Indian, King's Indian, Grünfeld, Benko Gambit. The Encyclopedia of Middlegame course contains detailed material about typical pawn structures: Karlsbad, Hedgehog, etc. Chess Middlegame II course composed by GM Alexander Kalinin is aimed at teaching a student much of the middlegame methods and intricacies through a theoretical section. The following openings are viewed: Sicilian defense (Dragon, Najdorf, Paulsen variations), Ruy Lopez (Open variation, Exchanged Variation), King's gambit, Italian game, Evans gambit, Pirc-Ufimtsev, Alekhine's defense, Nimzo-Indian defense, Queen's-Indian defense, Queen's gambit, Modern Benoni). Chess Middlegame III course contains 550 theoretical lessons and 500 practical exercises, aimed for 1800-2400 ELO players. The course includes typical plans and methods for the following popular openings: Petrov defense, Ruy Lopez (Marshall counter-attack, anti-Marshall system), Scandinavian defense, Sicilian defense (Closed variation, variations with 3. Bb5: Moscow variation, Rossolimo variation), Queen's gambit accepted (3. Nf3 Nf6 4. e3 and 3. e4), Grünfeld defense (4. cd Nd5 5. e4 Nс3 6. bc), Queen's pawn opening 3. Bg5 (1. d4 Nf6 2. Nf3 e6 3. Bg5, 2... g6 3. Bg5), Réti opening, King's fianchetto opening. Chess Middlegame IV course composed by GM Alexander Kalinin is aimed at teaching a student much of the middlegame methods and intricacies through a theoretical section. This course includes 560 teaching examples and 530 exercises for 1800-2400 ELO: Ruy Lopez, two Knights' defense, French defense, Sicilian defense, Caro-Kann defense, King's indian defense, Nimzo-indian defense, English opening etc. Chess Middlegame V course contains 520 theoretical lessons and 450 practical exercises, composed by GM Alexander Kalinin. The course includes typical plans and methods for the following popular openings: Vienna game, Petroff's Defense (5. Кс3), Four knights game with 5. Bb5, Ruy Lopez (Berlin defense, variation with 3... Bc5 4. O-O Nf6), Caro-Kann (Panov Attack), Sicilian defense (Sveshnikov variation), Queen's gambit (Cambridge-Springs variation, Tarrasch defense), Nimzo-Indian defense (Leningrad variation, variation with 4. g3), Queen's Indian defense (Petrosian system), Trompowsky attack (1. d4 2. Сg5). This training course is a special subset of famous CT-ART 4.0 course, based on best chess studies, especially chosen for their instructive value. There is simply no substitute for the ease and quality of the studies presented, not to mention their eternal beauty. Endgame Studies includes about 950 greatest endgame compositions and 900 subsidiary exercises. Each position comes with a special hint unique to this course – a 5x5 mini-position designed to convey the very essence of the tactical maneuver used in the main example. 2232 games played by the Sergey Karjakin. 120 exercises: play like Karjakin and play against Karjakin. This course is aimed at club and intermediate players and presents the theory and playing hooks in the most sharp and deciding variations of the Sicilian Defense developing after moves 1. e4 c5 2. Nf3 d6 3. d4: the Dragon variation, the Najdorf variation, the Scheveningen variation and the Richter Attack. The course presents a deep overview of the actual variations, featuring 200 examples and 630 exercises. The course will be useful to all chess players employing the Sicilian Defense on either white or black sides. This course is aimed at club and intermediate players and presents the theory and playing hooks in the most sharp and deciding variations of the Sicilian Defense developing after moves 1. e4 c5 2. Nf3 Nc6: the Lasker variation, the Paulsen variation, the Labourdonnais variation, the Simagin variation and the Boleslavsky defense. The course presents a deep theoretical and practical overview of the actual variations, featuring 300 examples. Numerous new exercises provide a great opportunity to reinforce your knowledge: 300 exercises in total for all variations after 1. e4 c5 2. Nf3 Nc6. This course is aimed at club and intermediate players and presents the theory and playing hooks in the most sharp and deciding variations of the French Defense developing after moves 1.e4 e6. The course presents a deep theoretical and practical overview of the actual variations, featuring about 130 examples and about 330 exercises to solve. The course will be useful to all chess players employing the French Defense on either white or black sides. This course is aimed at club and intermediate players and presents the theory and playing hooks in the most sharp and deciding variations of the Caro-Kann Defense developing after moves 1.e4 c6. The course presents a deep theoretical and practical overview of the actual variations, featuring about 150 examples and about 350 exercises to solve. The course will be useful to all chess players employing the Caro-Kann Defense on either white or black sides. This course is aimed at club and intermediate players and presents the theory and playing hooks in the most sharp and deciding variations of the Grünfeld Defense developing after moves 1. d4 Nf6 2. c4 g6 3. Nc3 d5. The course presents a deep theoretical and practical overview of the actual variations and 350 exercises to solve. The course will be useful to all chess players employing the Grünfeld Defense on either white or black sides. This course is aimed at club and intermediate players and presents the theory and playing hooks in the most sharp and deciding variations of the Scandinavian defense developing after moves 1. e4 d5. The course presents a deep theoretical and practical overview of the actual variations, featuring 28 examples. Numerous new exercises provide a great opportunity to reinforce your knowledge: 261 exercises in total. About 2600 games played by the legendary World Champion. And about 260 exercises in which you should play like Tal. All 1913 games played by the World Champion. About 370 of them with commentary. 110 exercises: play like Carlsen and play against Carlsen. This chess course is aimed at club and intermediate players and presents the theory and playing hooks in the most sharp and deciding variations of the King's Indian Defense developing after moves 1. d4 Nf6 2. c4 g6 3. Nc3 Bg7. The course presents a deep theoretical and practical overview of the actual variations and 430 exercises to solve. The course will be useful to all chess players employing the King's Indian Defense on either white or black sides. This chess course is aimed at the club and intermediate players and presents the theory and playing hooks in Open Games, appearing after moves 1. e4 e5 2. Nf3 Nc6 3.Bc4. The course presents the overview of the actual variants and 630 exercises for solve. This chess course is aimed at club and intermediate players and presents the theory and playing hooks in the most sharp and deciding variations of the Slav Defense developing after moves 1. d4 d5 2. c4 c6. The course presents a deep theoretical and practical overview of the actual variations, featuring 100 examples and 300 exercises to solve. The course will be useful to all chess players employing the Slav Defense on either white or black sides. This chess course is aimed at club and intermediate players and presents the theory and playing hooks in the most sharp and deciding variations of the Benko (Volga) gambit, appearing after moves 1.d4 Nf6 2.Nf3 c5 3.d5 b5. The course presents a deep theoretical and practical overview of the actual variations, featuring 168 exercises in total. Numerous new exercises provide a great opportunity to reinforce your knowledge. All 2466 chess games played by the legendary World Champion, 298 of them with commentary. 225 exercises: play like Kasparov and play against Kasparov. All 2929 chess games played by the legendary World Champion, 539 of them with commentary. 191 exercises: play like Anand and play against Anand. All 2537 chess games played by the legendary World Champion, 394 of them with commentary. 126 exercises: play like Kramnik and play against Kramnik. The program contains 1300 deeply annotated chess games played by the 4th World Champion Alexander Alekhine. 600 games are commented for the first time. 200 carefully chosen positions for you to solve, representing some of the most interesting and instructive positions from Alekhine's games in an additional section. The most complete collection of Botvinnik's games ever compiled. Contains as many as 1069 chess games played by Botvinnik from 1924 till 1970. Special section, "Play as Botvinnik" with 350 quiz positions for you to try and find those strong and beautiful moves played by Botvinnik in his games. The most complete collection of Emanuel Lasker's games ever compiled. Contains 630 games, covering the entire long career of the 2nd World Champion in chess (held the title from 1896 to 1921). All the games are deeply annotated. Special section, "Play as Lasker" with 203 quiz positions to try and find both strong and beautiful moves played by Lasker in his games. 640 deeply annotated games played by the 3rd World Champion Jose Raul Capablanca. 250 most interesting and instructive positions from his games in an additional program "Play as Capablanca". All 517 games played by the legendary World Champion. 55 exercises: play like Steinitz and play against Steinitz. This course will help you master a venomous and practically unavoidable opening White can use against Black. With it, any Club or Intermediate level player can quickly and efficiently develop an solid plan for White and win the offensive initiative in the opening. This opening has been in use for hundreds of years, and with great effect. You can find it in the repertoire of world champion Magnus Carlsen and other prominent players - Johannes Zukertort, Akiba Rubinstein, Artur Yusupov. This course includes more than 145 insightful exercises, making it a superb tool for quick training of chess club players and intermediate players. Two famous grandmasters, chess theorists and trainers, Sakaev and Landa, attempt to "sieze the unsiezable": outline and elaborate on all of the most important elements of chess strategy that every competent player must be aware of. Hand-picked, deeply analyzed games and excerpts come both from classical, well-known pieces and modern practice. The first volume consists of two parts: Opening and Middlegame. The book is aimed primarily at ELO 1800-2200 players, but even more experienced learners will probably find plenty of useful advice and guidelines. Suitable both for self-study and for use in specialized chess schools. Includes 275 instructional examples and 73 exercises for practice. Two famous grandmasters, chess theorists and trainers, Sakaev and Landa, attempt to "sieze the unsiezable": outline and elaborate on all of the most important elements of chess strategy that every competent player must be aware of. Hand-picked, deeply analyzed games and excerpts come both from classical, well-known pieces and modern practice. Volume 2 has two parts: "Pawn: the soul of chess" and "Game dynamics". The book is aimed primarily at ELO 1800-2200 players, but even more experienced learners will probably find plenty of useful advice and guidelines. Suitable both for self-study and for use in specialized chess schools. Includes 432 instructional examples and 164 exercises for practice. Nikolai Kalinichenko, an international grandmaster in correspondence play and the author of some 40 chess titles, presents here a complete and up-to-date opening repertoire. It is intended for players of positional style, or for use when the competitive situation demands a solid approach. The repertoire is based on 1 e4 as White, and the Classical Sicilian and King's Indian Defence as Black. Also available is the companion volume An Aggressive Opening Repertoire for the Club Player, offering a range of openings which are closely linked, but which are less forcefull in character. This course includes more than 400 exercises. These exercises makes this course an excellent tool for quick training of chess club players. Nikolai Kalinichenko, an international grandmaster in correspondence play and the author of some 40 chess titles, presents here a complete and up-to-date opening repertoire. It is intended for players of a attacking style, or for use when the competitive situation demands an aggressive approach. The repertoire is based on 1. e4 as White, and the Sicilian Dragon and Leningrad Dutch as Black. Suggestions are also offered against all the opponent's main alternatives. Also available is the companion volume A Positional Opening Repertoire for the Club Player, offering a range of openings which are closely linked, but which are less forceful in character. This course includes more than 350 exercises. These exercises makes this course an excellent tool for quick training of chess club players.